The period of the 11th and 12th Centuries were probably the golden era of stained glass window production and some pieces at Rivenhall were manufactured during this period. The East Window at St Mary’s is considered by the experts to be one of the finest examples of the stained glass art still in existence today. Rivenhall church was remodeled in 1838-9 by J. A. Repton, but archaeological investigations suggest original fabric dating back to 10th or 11th century survives. Much of the old glass together with some other pieces at the Rectory was brought to the church in 1840 from France by the then rector, Revd B. D. Hawkins. The 12th and possibly the 13th and 16th century panels are said to have come from the church of St Martin at Chénu in Sarthe. The church at Chénu was rebuilt in the 16th century but has architectural features of a late Romanesque building of c1150. This date supports Grodecki's suggestion for the earliest glass brought to Rivenhall being made about 1170-80. The fact that parish churches in France and England were installing painted glass during the 12th century has been explored by Marks. Whilst there is no documentary evidence that the later 16th century glass came from Chénu, the rebuilding of the church in the 16th century suggests it could well have come from here. 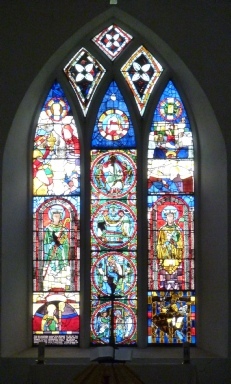 The glass from Chénu was set in the east window at Rivenhall around 1840. The layout was modified in the 1950’s. Four large medallions with borders representing a Majesty, an entombment of the Virgin (? ), the Virgin and Child and the Annunciation, late 12th C; two large figures of bishops or abbots, 12th C; a figure on horseback in banded mail with background, possibly heraldic and inscription 'Robert Lemaire', 13th C; the Adoration of the Magi, fragmentary, late 15th /early 16th C; a bishop and various panels with figure subjects, fragments etc of various dates. See detailed description page right. 14th & 15th C fragments in tracery. Of course, Christ was raised from the grave to ascend into heaven, and this medallion tells that part of the story by showing his burial after his death on the Cross. The details of the sarcophagus and the lamp show interesting detail of the current fashion in design. The Virgin Mary has always been important in the life of the Church as demonstrated by the dedication of our own church to her. In the twelfth century there was a particular emphasis on her role as Mother of God. Our medallion is unique in combining the iconography of the Virgin in Majesty with the Virgin of Tenderness. Majestically she is seated on a throne., haloed and crowned with two angels in attendance holding sceptres (the Virgin is Queen of Angels). Yet on her lap she holds the Child Christ and tenderly she looks at him and not straight ahead and offers him her breast, symbolising her motherhood of Christ. The dove of the holy spirit reminds us of his role in bringing Christ to birth. The Virgin Mary is standing in front of a chair with a cushion in a period decoration. She holds up her hand in surprise and prayer at the visit of the Angel Gabriel half kneeling on the left. A fragmentary 16th Century picture of “The Adoration of the Magi". St. Mary is in the bottom right (wearing blue) carrying tie Christ Child (white) in her arms. One king (wearing yellow) bottom left is offering a gold cup. Above him, another king with dark skin and a crown-hat offers an elaborate cup. The man in the top right with the red mantle may be the third king/wise man or may be Joseph. Two 12th Century French Archbishops. These are only known illustrations of archbishops from the period they are wearing a chasuble (green on left yellow on right) used to celebrate the Mass. On top of them they wear a white pallium (‘Y’ shaped) to show they are archbishops. Their crooks, facing outwards, and their distinctive flat-topped mitres are the usual signs for bishops c.1180. A unique 13th century glass presumably of the knight Robert Lemaire (his name is inscribed along the top border) who gave some glass to Chénu. Although the glass is badly corroded the posture the night is adopting is clear. The same stance of a knight sitting on horse back was commonly used on seals of the period. The Rev. Bradford Hawkins was curate of Rivenhall when in 1839 he went to France to be with his dying father who lived there. Perhaps with his father's estate he bought the glass (costing 400 francs) and brought it to Rivenhall in 1840.